Butterflies can be beautiful – a true sign of summer. It can be lovely to see these pretty creatures flitting around our gardens and polytunnels. But while we want to attract butterflies and help to preserve them in our organic gardens, butterflies can also pose a problem when it comes to growing certain crops in your polytunnel. Those butterflies will lay eggs which can quickly transform into little caterpillars which can eat leaves at an alarming rate and undo all your hard work in growing those plants. Caterpillars of cabbage white butterflies, for example, can munch their way through plants in the cabbage family astonishingly quickly. Below, you will find a new basic tips to help you deal organically with butterflies in an organic polytunnel garden. As soon as you see butterflies fluttering around your garden and polytunnel, organic gardeners should begin regular inspections of polytunnel plants. No matter what other organic measures you may take, there is no substitute for simply being observant. Look on the undersides of leaves of brassicas and other important crop plants that butterflies might go for, and gently wipe off any eggs that you may find there. While it may seem brutal, removing the eggs right away is the best way to avoid a caterpillar brassica massacre later on. A more kindly way to try to avoid butterflies laying their eggs on your crop plants in the first place is to provide butterflies with plants that they will like more. By planting things that are favoured habitats for butterflies and their caterpillars, but which we do not mind losing, we can distract the pests and keep them away from our food crops. Nasturtiums are one option for a trap crop for cabbage whites and other butterflies. In addition to planting trap crops to lure butterflies away from your valuable crops, you can also companion plant with brassicas in order to repel the pests. Aromatic herbs such as lemon balm, sage, oregano, dill, borage and rosemary may help to keep them away. Some organic gardeners have claimed to have success to keeping cabbage whites away by placing decoy (pretend) cabbage white butterflies in amongst their crops. This is said to keep the butterflies away because they are territorial and so will tend to keep their distance from what they perceive to be another butterfly. You can make white decoys with paper, or the white plastic from a milk container, for example, and attach them to strings so they ‘flutter’ about a bit. Of course, to be sure that you will not lose brassicas to caterpillar attack, the only thing you can do is completely cover vulnerable crops with netting before the butterflies go near. Nets should be firmly secured to the ground, as butterflies will take advantage of any tiny opening. It is also a good idea to still check regularly for any eggs on the plants below. 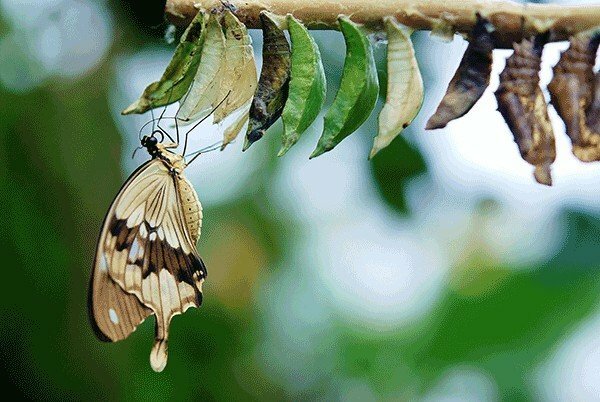 Have you successfully used a decoy butterfly to deal organically with butterflies? Let us know in the comments below.